Yes it can be done! You can actually make healthy gluten, free, oil, free, vegan sausages. They just so happen to also be very low sodium and sugar free. It sounds too good to be true but trust me this works. I was inspired by the new Engine 2 Cookbook and their recipe for Epic Brats. Hubby Tom, our friend Lorna and myself made the ones in the cookbook for a potluck on Saturday that we hosted. They lived up to their name and indeed were epic. Our friend, Chef AJ was staying wtih us and because of her sensitivity to legumes she wasn’t able to enjoy the sausages. The next day she asked me if there was anyway we could make them without legumes so she too could enjoy a healthy vegan sausage. 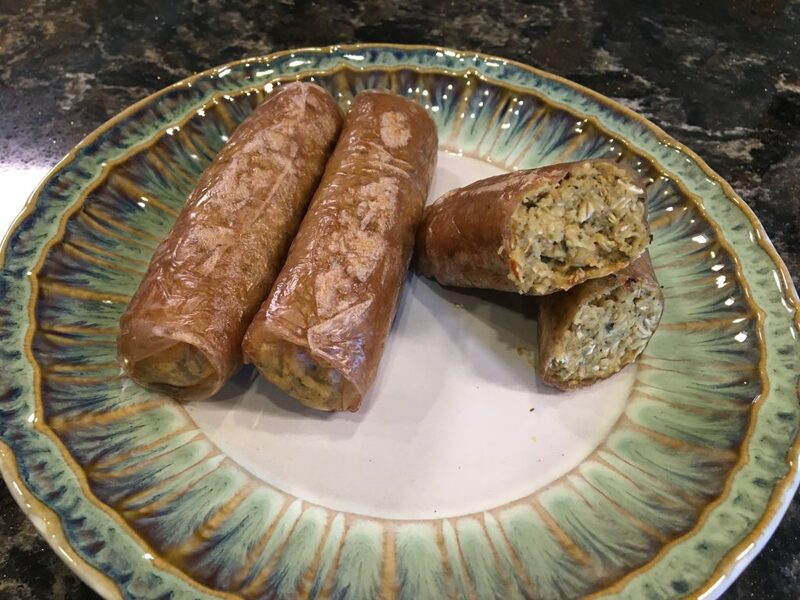 I decided to try using the Breakfast Sausage Recipe that is already here on the blog that was created by Kerry Bluemthal a fellow Ultimate Weight Loss member. I am happy to report that it worked just like I was hoping it would. 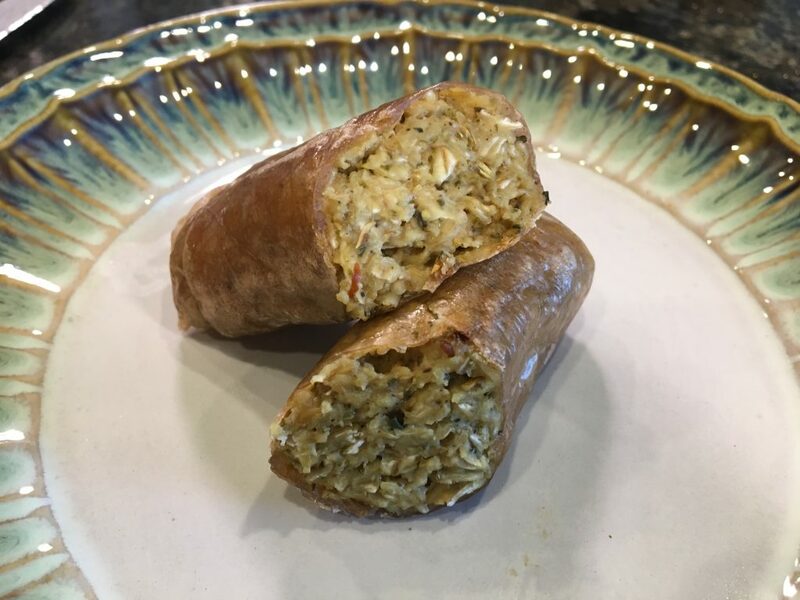 I am calling these Darn Good Vegan Sausages! You wouldn’t even know that the “casing” on this “sausage” is a brown rice wrapper. Something magical happens during the time it’s in the pan heating up. The texture of the wrap changes and it’s fabulous. You really have to try it and experience it for yourself. 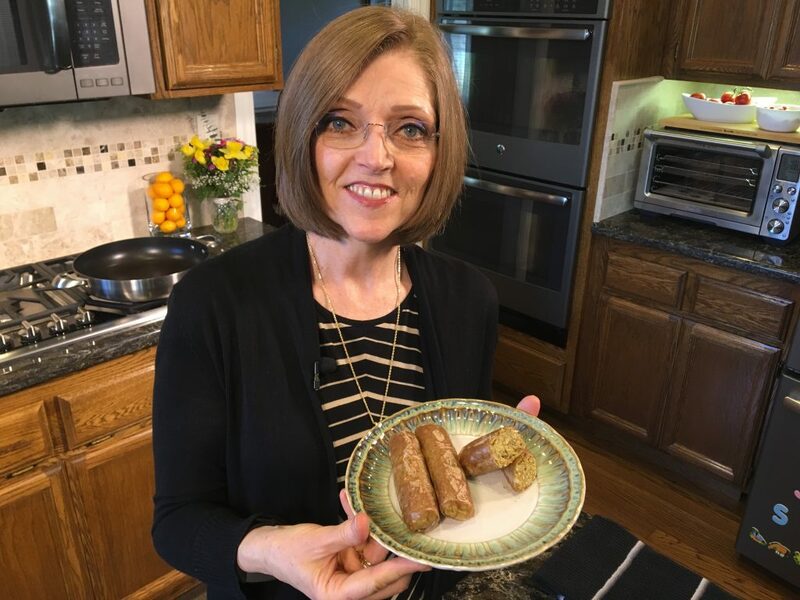 To make it easier for you, hubby Tom and I made a video to show you from start to finish just how easy it is to make these Amazing Vegan Sausages! Darn Good Vegan Sausage mixture shown in the “hot mess” stage. 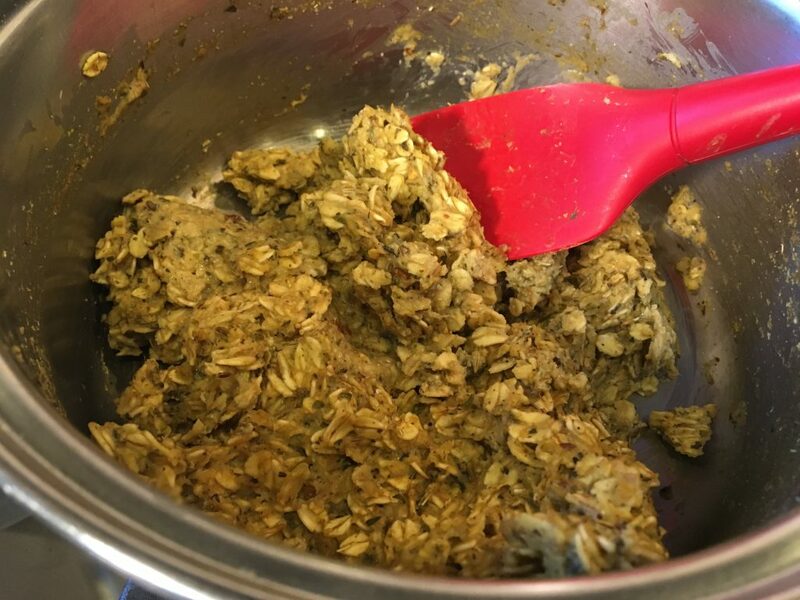 A picture is worth a thousand words they say – so here is a photo of how the oat mixture starts to look like a “hot mess” and it’s ready to take off the burner. You can see this in the video as well. Form the sausage mixture into oblong rolls and chill for 15 – 20 minutes. A little time to chill in the fridge makes everything easier to handle so don’t skip this important step. Where plastic gloves if you have them and keep the mixture from sticking to you hands. Wrapped and ready to chill in the fridge for another 15-20 minutes. After the sausages have chilled in the fridge for 15-20 minutes to set the wrapper they are ready to be browned in a preheated non – stick skillet. This is an affiiliate link to my ScanPan that is ceramic and non-stick. I use this for everything – in fact it rarely gets put away in the cupboard because I use it all the time. You can saute and brown everything without a drop of oil – that’s right not one drop of oil. It cleans up easily as well. Gotta love that! Keep turning the sausages over to brown them evenly on all sides – 5-7 minutes is all it takes. That’s when the magic happens and the texture of the brown rice wraps changes into something special. You just have to make them to find out for yourself – I have no words to explain what happens. The recipe in the Engine 2 Cookbook says they can also be grilled so we will have to give that a try as well. Just think of the fun we can have with the BBQ this summer with our Darn Good Sausages. A little mustard and some saurkraut – now we’re talking! I think there are so many different possibilities when it comes to seasoning the filling mixture for Darn Good Vegan Sausages. Just like the ones in the Engine 2 cookbook we can make different sausages based on the seasonings and add ins. Maybe some sun dried tomatoes, onion, garlic, pepperoni seasoning and fresh basil for a pizza flavor. Some cooked red lentils, curry, cinnamon and turmeric for an Indian style. What about a little chopped apple, cranberries, sage and onion mixture for an Apple -Cran stuffing type sausge. Mexican with jalapeno, corn, ground cumin, and chipotle powder. See what I mean, the possibilities are endless. Put spices, nutritional yeast and ground flax in boiling water in a medium size sauce pan on the stove, stir, add oats and stir while cooking until it starts to come together and looks like a “hot mess.” This takes a couple of minutes because the oats need to cook. Remove from the heat. Line a baking sheet or tray with parchment paper. 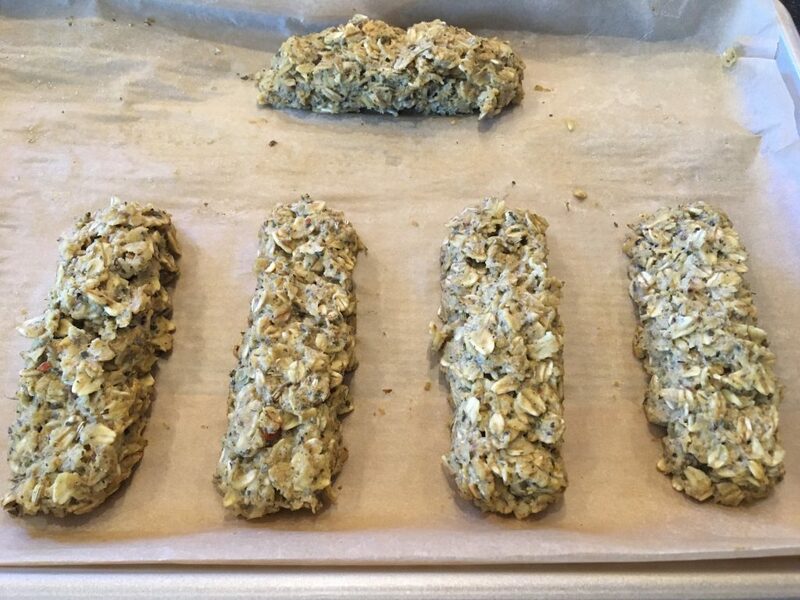 Using 1/3 cup of mixture at a time roll in your hands to form a log shape, place on parchment paper. Repeat with the rest of the mixture. Chill for 15-20 minutes in the fridge to help it set up. Once chilled remove from the fridge. Put warm not hot water in a large bowl. Dip one brown rice wrapper at a time in the water, let excess water drip off. Place damp wrapper on a cutting board. 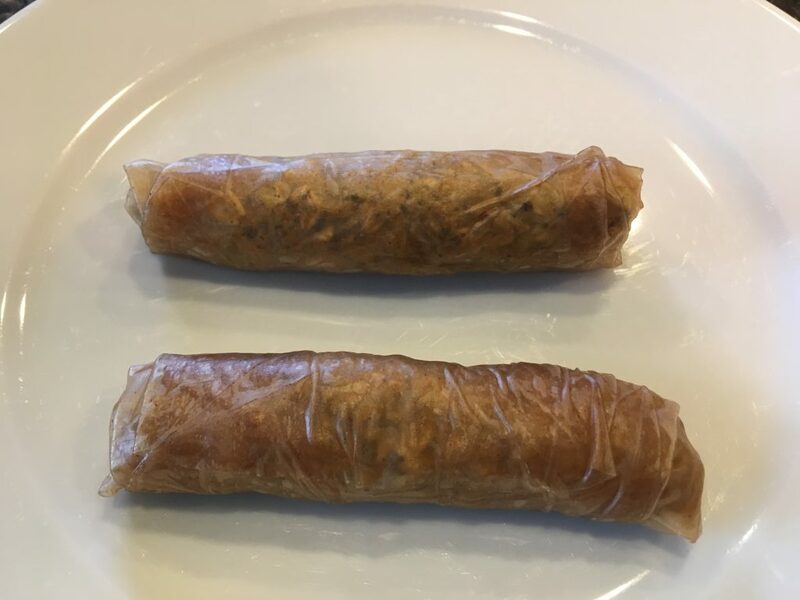 Take one of the sausage logs and place it towards one end of the wrapper, fold up the wrapper nearest you over the sausage mixture, fold in the sides and roll up. Place on a plat or parchment lined baking sheet being careful that they don’t touch as they will stick together. Repeat with all the sausage mixture. Chill for 15-20 minutes. Preheat a non stick skillet over medium heat, add sausages leaving enough room in the pan to roll them over. Cook for 5-7 minutes rolling the sausage over to be sure they brown on all sides. Remove and enjoy with your favorite condiments! Variations: I plan on makign different sausages based on the seasonings and add ins. Maybe some sun dried tomatoes, onion, garlic, pepperoni seasoning and fresh basil for a pizza flavor. Some cooked red lentils, curry, cinnamon and turmeric for an Indian style. What about a little chopped apple, cranberries, sage and onion mixture for an Apple -Cran stuffing type sausge. Mexican with jalapeno, corn, ground cumin, and chipotle powder. See what I mean, the possibilities are endless. Basic sausage recipe created by Kerry Blumenthal, wrapping in a brown rice wrapper inspired by Engine 2 Cookbook. Watched you sausage video yesterday and I’m going to give this a try. They look absolutely delicious! Hoping my husband will give them a try. Heading to Whole Foods today,are the brown rice papers in the freezer section? Hi Jan you will find them in the Asian food aisle on a shelf. Enjoy! Can these be prepared ahead of time and frozen? I don’t know if they freeze yet – we haven’t tried to yet. It’s a brand new recipe and I haven’t had time to experiment with it yet. I will keep you posted here on the blog if we freeze them. We haven’t tried that but if you do let us know! Chopped pecans and dried cherries! Thank you, Tami!! I could not find where to give your video a thumbs up but had no success. Anyway, thanks for the video! I found a place in Chico to get the brown rice wraps so will be making some to heat up tomorrow for my neighbor’s weekly get together. I always try to bring something they will like, to show them they could enjoy WFPB-noSOS food. It’s a tuff crowd though. Cattle Ranchers! Cattle ranchers would be a tough crowd for sharing your love of plants with! Good luck with the sausages – I find sometimes that if I don’t try to sell the food as a replica of a standard American diet food it goes over better. So instead of calling them sausages maybe call them a wrap! Hi Tami….how nice to hear your voice! I was just used to seeing you in photos! Your sausages look amazing! I have started a Gluten Free way of eating. Not a celiac but gluten bothers me. After a month of eliminating gluten I feel great! I plan to spend some time looking at all your new recipes and reading about your journey! Hi Carol – I eat gluten free because of my hypothyroidism and it sure does make a difference! Well…. I didn’t find Brown wrappers. So hopefully the clear ones won’t look too creepy. Definitely going to try this, this weekend. We miss our brats!!! Carolyn, I think they will work just fine! They are bit thinner than the brown rice ones so they might tear more easily but it should be fine! Let me know how they turn out. Are you using dried leafy sage or dried ground sage in this recipe? Thank you for the great work you do here and for sharing your recipes with us. Hi Rebecca – I used dried ground sage as that is what I had on hand. I was interested in the sausage recipe and the information but then I saw your plates…they are so pretty. Would you tell me the maker and name of the dinnerware? I would so appreciate it. Thank you for all of your time and information of the Ultimate eating way. I buy random kitchen ware for blog photos! The green rimmed plate says Pier One – Seasside on the Bottom. My white plates are Apilco from France and available from William Sonoma. I love dishes! I am back after watching the sausage making video. Those look good and they would be a great filling main course or added to salads and probably many other uses. Jeannie – they are so good and versatile. I hope you give them a try and let me know what you think. Thank you for the replies; both for the dishes…I love dishes too, I looked for the Pier 1 Seaside but did not find but one salad plate. I will keep looking off and on. and for the sausages…I bet I would love them. I also told a friend about them and I am going to send her the link to your recipe video so she will be able to watch and also send it to other friends who may be interested. Thanks again so much. Have a wonderful day. I am pretty sure I have had the plate for years – maybe more pieces will show up! Great video! I love watching all of your videos–feels like I’m sitting in your kitchen having a chat! Can’t wait to try these sausages on my family!! I like seeing your youtube videos but when I sign up or comment I start getting an incredible amount of unwanted you-tube stuff sent to me. Any way around this? I am glad you like the videos – love to get feedback! You Tube does try to keep you watching what they think you would like – Tom says there seems to be more of that than there used to be. I don’t know if there is anyway to stop that or not – Google it and see what comes up! So yummy! Can I freeeze the sausages? I don’t know if they freeze well – I haven’t tried. I suggest freezing one and see how it works! OMG…I am so glad I came across your site…. I just made your Creamy Balsamic Dressing…..FINALLY found a no oil dressing that I like…it is soooo….tasty!! And will be trying to make these sausages as well next week…. following your you-tube channel now too! tonight’s dinner will be a BIG SALAD with your dressing!!!!! THANK YOU….THANK YOU….THANK YOU for your videos, your blog, your recipes!!! Aaaaah! Thank you Chris – it is feedbback like yours that makes this all worth while. I am so happy to know you like the salad dressing. Wishing you well on your journey into plants! Hi. I’ve made these and they are fabulous! Going to make them again and thinking of putting them in the Breville. How long might you recommend in the air fryer? Thanks. I haven’t tried them in the air fryer but I would maybe do a lower temperature and really watch them close so they don’t split open. Maybe try one at a time until you figure out the right temperature. Be sure to come back and let me know how it works! Love your blog and now all your videos. Thanks for what you do! I’m curious how large the ScanPan is that you have, esp since you say you use it all the time. Is it 10in or 12 in or something else? For some reason the link is not working for me. I’m just finishing Day10 of my SOFASfree journey, and learning loads from all your advice. Thank you for your kind comments. The Scanpan I use is a 5 1/2 QT and it isn’t available on Amazon right now but I think you can get it from Surlatable. I got the one with 2 handles because I was worried about storing it with a long handle. I keep it on my stove most of the time because I use it so much. It is difficult to empty the contents out of it when by myself – so much easier with on long handle. Even so I am glad I got the one with two handles – just wanted to point out what I have learned after buying so you can consider it. I am so glad you are enjoying the blog and Youtube videos. This is exactly why I spend my free time keeping this blog going – to help people so they will continue with this lifestyle. Be proud of yourself for making these changes! Tammy, I just read bove you are gluten free. Did you start GF when you started WFPB? Or did this come along later? I am wondering if I have an issue with gluten as well. No matter how well I eat, I just keep gaining weight. I know when I started my WFPB life , I started with a 30 day juice fast. I felt fabulous, lost weight, and eliminated much of my pain. But I hate the hassle of cleanup so cant get my head into it again. The food plan is WFPB as well as salt, oil, sugar, flour and alcohol free. We also don’t eat the healthy but higher fat foods like soy products, nuts, seeds, dried fruit and avocado. All of those higher calorie density foods can be the difference in losing weight or not. It is a starch based food plan – potatoes, sweet potatoes, rice, quinoa, legumes, veggies and fruit. I love it! It’s been the best program ever for me. It also includes educational information about processed food addiction and the Pleasure Trap. Once you learn about all of this it makes so much sense to eat the way we do. I never could moderate eating the foods I used to eat. I didn’t know how addictive those foods were I just though I didn’t have any willpower. It was such a relief to find out I wasn’t broken – I was just trying to eat the wrong food! I did a juice fast one time for one day – it was so much work to make all that juice and expensive too. I much prefer to eat food even though I know people love to juice and have good results from it. I hope this information was helpful. Let me know if you have other questions. Thats exactly what I did. I know my thyroid is a little on hypo side. MY tsh was about 3 to 4 last time checked. But I lost about 32 lbs juicing, then lost another 10 after. Held it off for few months, then suddenly started gaining. I have since gained back all but about 10 lbs. At home, I avoid oil, and no added sodium, and only sugar is in some non dairy choc chips. But I also eat some nuts on my salads since I read you needed some fats to absorb nutrients in the greens (Furhman I believe). I have noticed on days when I gain a couple lbs overnight that I have eaten some bread (only when I eat out). So I for past few days I have been trying to stay away from gluten as well for awhile. Have you had to go on thyroid med? Noticed any change in labs after gluten free? I am on a low dosage of Levothyroxine for my hypothyroidism. I feel a thousand times better since I started taking it! The symptoms of being hypothyroid were awful. Being gluten free has had no affect on my TSH or other labs – but I feel physically better.Once my thyroid stopped producing enough hormone it didn’t start up again. I have been told by two plant based doctors that you can’t reverse hypothyroidism and that a whole food plant based diet won’t correct it either. If I accidentally have some gluten – restaurant meal for instance I get lower abdominal pain. Gluten also has some addictive properties so it makes you crave more which is another good reason to avoid it. I know that Dr Fuhrman says you must eat some nuts with your salads to absorb all the nutrients but I haven’t done that in 3 almost 4 years and since giving up nuts I have been able to lose weight and keep it off. I don’t believe I am missing out on too many nutrients given the volume of healthy dark leafy greens I eat. The doctors at True North Health Center don’t believe you have to eat nuts with your greens to absorb the nutrients. The plant based docs do differ on little details like that. I guess we have to decide for ourselves which way to go. For me the extra fat and calories don’t allow me to be at a healthy weight and I don’t want to be overweight. So you might want to try an experiment for 30 days – cut out the fat, sugar and salt in your diet and see if it helps you to drop some unwanted pounds. If it works great if not try something else. I hope this helps. Just keep trying different things until you find the right balance for you. I just recently came across your blog and can’t wait to try your recipes! They look and sound spectacular!! I’ve been vegan for about 3 years now (sadly mostly processed foods) but more recently fine-tuned my diet to WFPB, no oil, no sugar (and hopefully now no salt after a second water fast!) And I’m down 51 pounds today in just over two months 🙂 I have a ways to go yet but have finally found my path! I have a question regarding this sausage recipe. Do you think it’s possible to turn the filling into meatballs and air fry them? Maybe with some kind of coating if needed? Obviously, I haven’t tried this recipe yet so I’m not sure if the consistency will work for that, so thought I’d ask your opinion. Thanks for being so helpful and sharing your wealth of information with all of us through this blog and videos. You have no idea how appreciated you are! Thank you for taking the time to leave a comment and share your journey with me. Welcome to the wonderful world of a WFPB oil free lifestyle! There are so many benefits to eating this way as you have already discovered. The sausage mix works well as a patty and browned in a non stick skillet on the stove so it might also work in the air fryer. I haven’t tried that myself but mix up a batch and try just a couple rolled into balls and air fried. That way if it doesn’t work you won’t be wasting a whole batch. Come back and let me know how it goes if you have the time to do so. I really appreciate your kind comments about the blog and videos – your reaction is exactly why my husband and I spend our free time keeping the blog and Youtube channel going. We want to pass it forward and help others to navigate this lifestyle change and maybe make it easier to stay on this course of action. You really made our day! Stay in touch and let me know how you are doing – I always love hearing success stories! I will definitely try the “meatball” idea in the air fryer and let you know. Also, good to know the recipe works for patties, thanks. I, and many others, are very appreciative to both you and your husband for all that you do. Paying it forward is something we ALL need to keep doing… would change this world in a heartbeat. Again, Happy Holidays and many blessings to you and your family!! Hi Tami!! 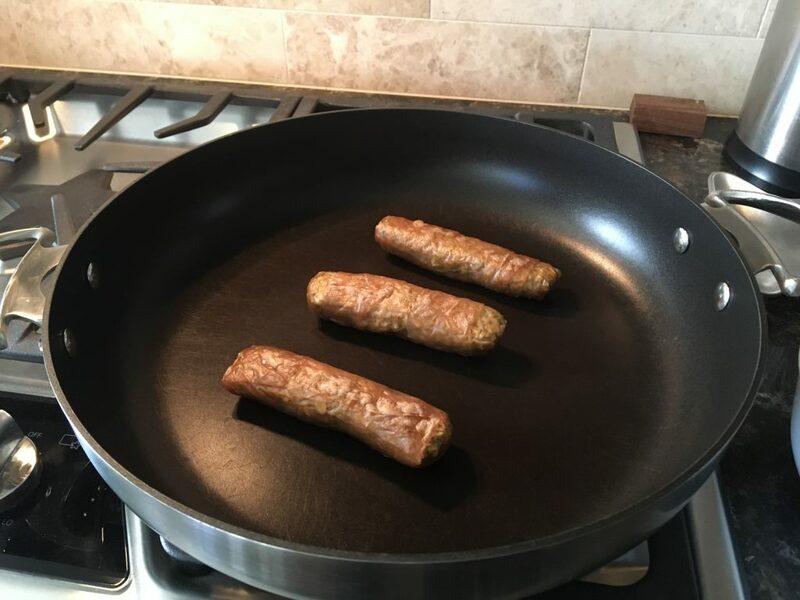 I just finished making these sausages and they are delicious…however, I had to add salt to mine to make it more palitable. I haven’t gotten rid of salt yet, but otherwise am WFPB and am a UWL subscriber. I haven’t been able to give salt up yet even after five years. Albeit that I eat a much smaller amount than before! Thank you for the delicious recipes!! I am so glad you liked these sausages. Thank you for taking the time to leave a comment. Tami- I hope you might help me. I am so grateful for your blog and showing me this variation of the Engine 2 recipe. I want to make the recipe with beans from the cookbook. Please tell me the if you have tried it and if the end result should be mushable inside the rice paper? The texture and firm ess is not quite there🧐. Can you help? Thank you for your kind comments. I only made the Engine2 version one time and we found them to be very dry not mushy. Did you drain the beans? I’m not sure what went wrong – sorry I can’t offer any advice on this one. Do they have a facebook page where people post recipes and share information? Maybe you could write to Jane Esselstyn and ask her I bet she has a Facebook page – her and her mom have a YouTube channel. You might be able to ask about it in the comments there. I am sorry they came out mushy for you. I hate it when I waste time and ingredients like that. I am so glad you liked them and so did your hubby! That is wonderful – thank you for letting me know!